I know it’s been a while; in fact it’s been an eternity. In a feeble attempt to make up for leaving you all to your own alcoholic devices, I have a true classic for you. The cocktail by which all others are judged, the Martini. More specifically the dry Martini. For a cocktail whose reputation far precedes it, information on the exact origin of this drink is sparse at best. A few theories exist, none standing out as the most likely or reliable. The most popular is that it is a variation on the Martinez, which I plan to cover in the very near future. The Martinez was made with gin, maraschino liqueur, sweet vermouth and bitters. By the late 1800s this evolved into a mixture of gin, dry vermouth and orange bitters that became known as the Martini. The drink gained popularity during prohibition when bath tub gin was one of the more readily available spirits. In practice today, the bitters have been eliminated and the cocktail is a simply elegant combination of two ingredients, gin and vermouth. The debate rages about the proper ratio between the two ranging from 7:1 to 2:1. The truly perfect Martini though is in the eye of the drink-holder. Of course I will give you my humble opinion, but I encourage you to experiment for yourself. 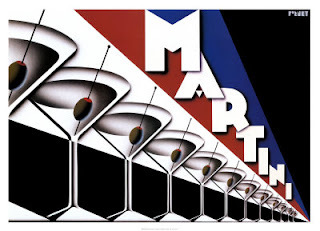 The other great Martini debate is whether to shake or stir. There are arguments for both, the James Bond defense not being one of them. The rule of thumb I use is translucence, if you are using dark or cloudy ingredients it doesn’t matter, if they are clear though the agitation of shaking the mixture makes it cloudy, it doesn’t alter the taste only the appearance. Shaking does seem to cool the liquids faster though, so I recommend chilling your glasses, your pitcher and your ingredients if you plan to stir. On the plus side, stirring seems to leaves a slight velvety feeling on the drink. Enough already, let’s get to the good stuff (who knew I could be so long winded for a drink with two ingredients). Start with your chilled pitcher and your favorite gin, I’m pouring Plymouth. Measure a precise two and one-half ounces and gently pour it into the pitcher. Pour in one-half ounce of dry vermouth (for the mathematically challenged that is a five to one ratio), add ice and stir. When you feel the mixture is properly combined and chilled, pour it into an ice-cold cocktail glass and garnish with three olives of your choice. Combine both ingredients in a chilled pitcher with ice, stir. Strain into a chilled glass. Serve with three olives.